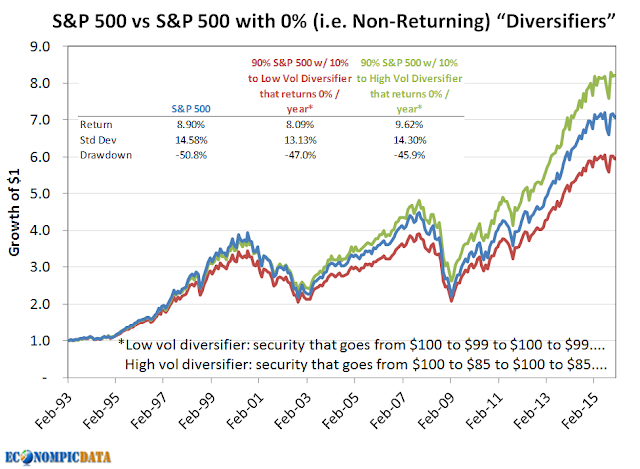 Which investment would you prefer to invest in to diversify your existing stock allocation? Easy question right? Perhaps not. Asset B may actually improve long-term returns and reduce risk at the portfolio level, whereas an investment in Asset A may just be a drag on performance. This post will walk through an example, outline the math behind the results, and hypothesize how an investor may want to think about this phenomenon. Going one step further, I will outline how this may, in part, explain the low volatility anomaly (one example being that low-volatility stocks have produced higher risk-adjusted returns than high-beta stocks in most markets studied). Asset A: which reverts monthly from negative to positive performance (-0.75%, +1.26%, -0.75%, +1.26%), compounding to a 3% annualized return at a 3.5% standard deviation; in the chart below this assumes price action of $100 to $99 to $100 to $99... but with an incremental 3% return built in. Asset B: which reverts monthly from negative to positive performance (-15.4%, +17.2%, -15.4%, +17.2%), compounding to a -5% annualized return at a 56.5% standard deviation; in the chart below this assumes price action of $100 to $85 to $100 to $85... but with an incremental -5% negative return built in. Despite the 8% annualized outperformance of asset class A vs B that compounded to a 100% gain in asset A and a 70% decline in asset B, the 90% stock / 10% allocation to asset B results in a combined portfolio with higher returns, a higher sharpe ratio, and a lower drawdown relative to an allocation to the positive returning asset A (the benefit of the allocation to asset A was the reduced standard deviation as that allocation reduced risk asset exposure by 10%). 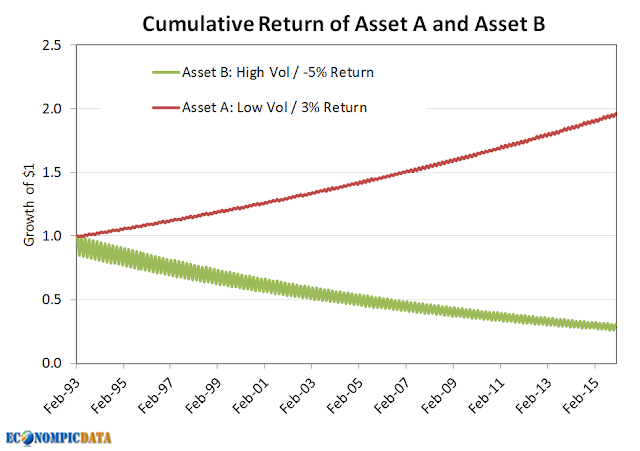 We see below how much asset B benefits the portfolio when both both asset A and B are on equal return footing. William Bernstein wrote a great piece on the topic back in 1997 titled The Rebalancing Bonus. The whole article is worth a read, but he shares the following formula that calculates the "bonus" received by rebalancing across asset classes. A higher standard deviation of either asset class will result in a greater rebalancing bonus as an investment gets "more bang for your buck"
In the case of a higher volatility solution, bullets #2 and #4 both result in a higher rebalancing bonus and higher return (all else equal). In my example, the rebalancing bonus went from roughly 10 bps given a 10% allocation to asset A to 150 bps given a similar 10% allocation to asset B. Given the 10% allocation, the return differential of 8% (the 3% return for asset A less the -5% return for asset B) x the 10% weight is only 80 bps, significantly lower than the benefit of the rebalancing bonus. 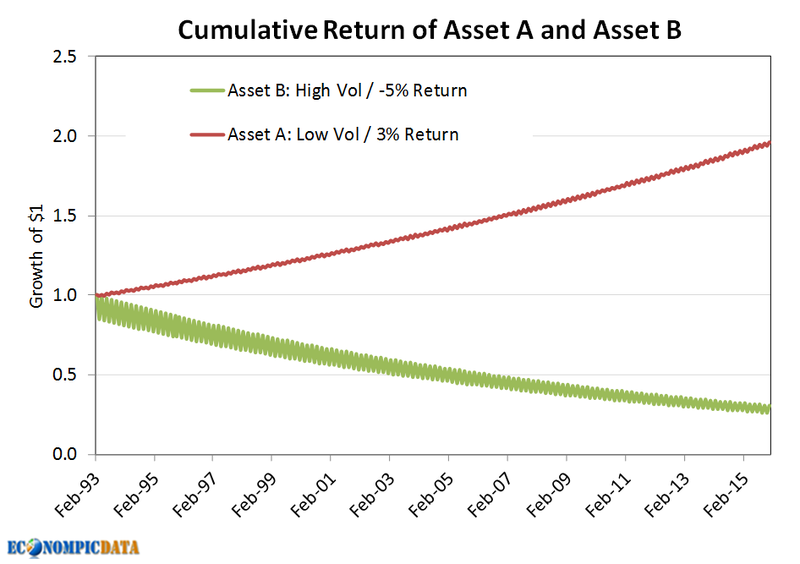 In this example, in order for the two blended portfolios to have a similar return, the return gap between asset A and B must be closer to 14%. From an asset allocation perspective, the above has a number of implications. For one, it certainly makes the case for an allocation to strategies uncorrelated to an existing portfolio that have higher levels of expected volatility. In my opinion, the most obvious strategy that is largely under-allocated to is managed futures and to a lesser extent certain hedge fund styles and (until the last 10 years when everyone piled in)... commodities. I would also note that return expectations for the traditional diversifier, core bonds, are quite low and volatility of those returns are anticipated to remain low (thus a rebalancing bonus near 0), thus an allocation to a high volatility diversifier only needs low (or potentially negative expected) returns to make sense. Another potential implication of the positive impact higher volatility strategies have on the rebalancing bonus is that this may partially explain the low volatility anomaly seen within asset classes, such as within stocks and bonds. 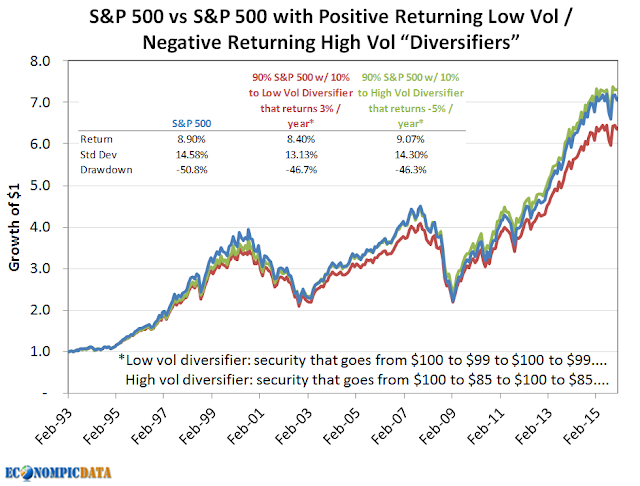 When viewed in isolation, the outperformance of less volatile asset classes seems like an anomaly, but when viewed within a broader portfolio construct it makes sense that these lower volatility investments may need a higher expected return to draw in investors. Pretty close to the 38 bps and 12 bp rebalancing bonus they provided in reality. In this instance, that 26 bp differential makes up ~25% of the excess performance a 50/50 S&P 500 / low volatility blend over that time frame. I'll leave it to others to chime in whether forward P/E's are useful or not given the fact they typically overstate earnings and I'll ignore that earnings may be at a cyclical peak (more on the latter here). As an aside, technicals in the market are filthy, as most short-term signals I look at are providing caution (example here). BUT, based purely on current forward P/E's relative to their own history, both large growth and large value stocks look awfully attractive if you are of the belief that the recent market noise is just noise vs. a sign of recession. 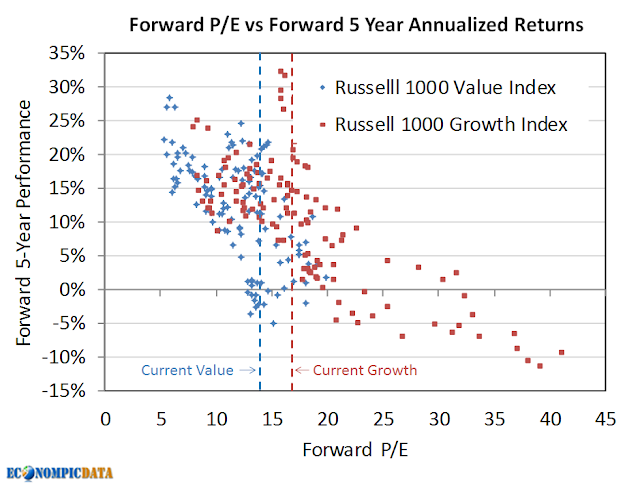 The below chart plots all quarterly forward P/Es against the forward 5-year annualized returns of both indices going back to the 1979 Russell inception of each. As of January 15th, the forward P/E of large value breached 14x while large growth went sub 17x, both historically great valuations to be buying at for the longer-term. Highlights include that the average forward 5-year annualized returns of large value / growth were 13.9% / 16.1% when the P/E was below current levels and only 7.6% and 5.5% when above (and growth has never had a negative 5-year return when the forward P/E was this low).